If you are familiar with Kodi you may have heard of the Maverick Kodi addon and may be curious to know more about it. In this article we will address questions related to its safety and the legality before you decide to install Maverick on Kodi as well as look at some possible alternatives. 3 What is the Kodi Maverick TV Addon? Should you install Maverick? 7 Which Maverick TV alternative will you choose? Kodi is a multi-featured, open source media player. Kodi allows for the playback of both audio and video content from different sources. Content can be played from local storage, external storage, and/or from online sources. Kodi is available on a number of platforms such as Windows PCs, Mac computers, Amazon Fire TVs and Fire sticks, the award winning Nvidia shield, Android devices and iPhones. We recommend using a Virtual Private Network (VPN) when streaming with Kodi. A trustworthy VPN will offer privacy and security benefits. Although it’s possible to use a VPN to hide the streaming of pirated content from an Internet Service Provider (ISP), the positive uses shouldn’t be ignored. VPNs can help to prevent some man-in-the-middle attacks. This type of attack allows a hacker to intercept your data, making you susceptible to having your data stolen and manipulated. In addition, even if you stream from legitimate online sources, some ISPs will throttle your connection if they think that you’re sucking up bandwidth. VPNs can also allow access to content which is usually restricted to certain geographic locations. Streaming video via Kodi or any other medium requires a lot of bandwidth. All VPNs will slow your internet speeds down to some degree, although some services will hit your bandwidth hard, making streaming without buffering more difficult. You will need a VPN which slows down your connection as little as possible when streaming with Kodi. We recommend using IPVanish. It provides a fast connection, allowing you to effectively stream videos. It’s also compatible with several gadgets such as iOS devices, Android devices and Linux computers. What is the Kodi Maverick TV Addon? Should you install Maverick? 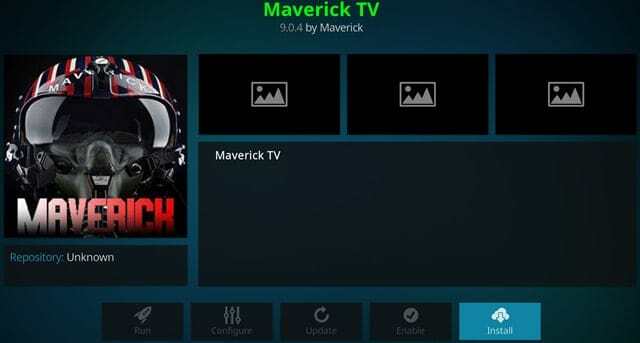 Maverick TV is a third-party Kodi addon which offers movies, TV shows, live TV, sports and documentaries. Some videos are even available in Ultra High Definition (UHD). However, Maverick TV provides access to media through pirated streams which are illegal in many countries. For this reason, we don’t recommend using Maverick TV and suggest you consider some official alternatives instead. While most third-party addons are harmless, some developers have used these addons for malicious reasons in the past. You should, therefore, be careful if you choose to install one and check to see if it streams illegally. If it seems that the content it’s offering should be paid for, it’s likely offering access to illegally-offered media..
With that being said, let’s look at some Maverick TV alternatives. 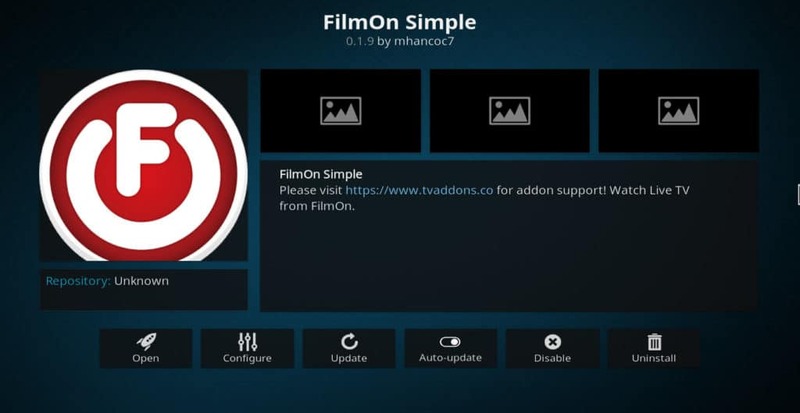 FilmOn Simple is an official Kodi repository addon which has a wide variety of content. You can find live TV, movies, TV shows and documentaries through FilmOn Simple. The addon essentially allows access to the FilmOn TV service through Kodi. With FilmOn Simple you will have access to live TV channels such as CCTV News and FilmOn Tennis if you’re into tennis and sports, movies such as Marilyn Monroe and Karate Kill, and documentaries like Bob Marley – Freedom Road. You will even be able to view animated titles. There are several free offerings available which are mostly in standard definition (SD). If you wish to view a wider selection of content as well as the ability to view HD quality content, then a FilmOn TV subscription is required. 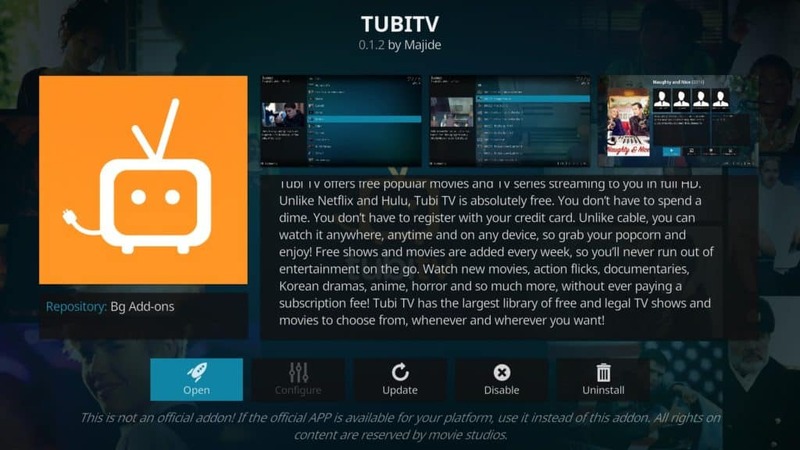 Tubi TV is an online streaming service with a large, legal library of content available for free which you can access through its official Kodi addon. While sometimes free services bring to mind poor quality and boring shows, this is not the case with Tubi TV. You will find popular titles such as the Inbetweeners and Fairy Tail among others. Some of the shows are even in HD. You can find anything from TV shows to documentaries on Tubi TV, but there are no live TV options. There are several thousand titles available but some of them are geolocked. However, using a VPN can help you to bypass this block and access the full Tubi TV library. 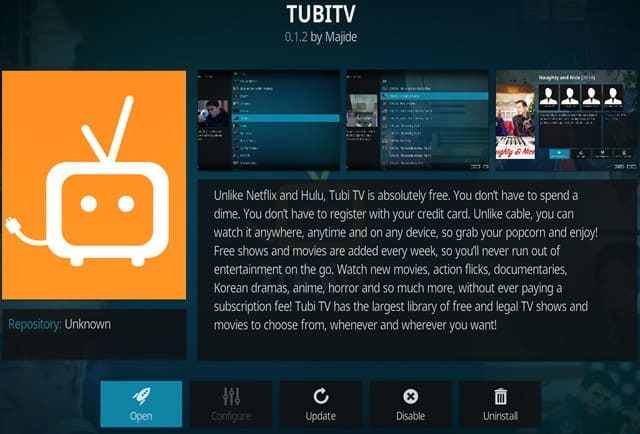 You’ll find Tubi TV in the official Kodi addon repository. Crackle is a free service which carries several movies and TV shows which you can access through it’s official Kodi addon. You won’t find as many titles as with Tub iTV but there are quality shows available such as Shark Tank and movies like The Interview. You won’t be able to catch any live TV with Crackle but the available selection is worth checking out. There are some animated titles available as well. Crackle can be found in the official Kodi addon repository. 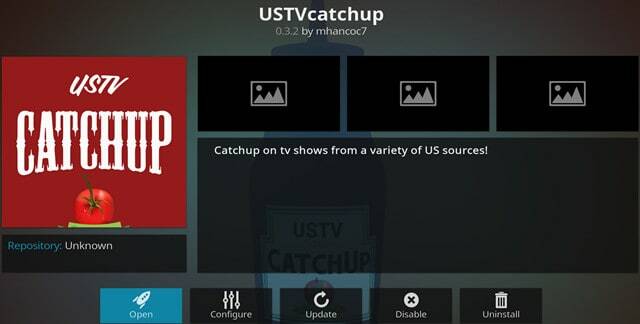 USTVcatchup allows you to, as the name suggests, catch up with your favorite TV shows from networks in the U.S. This means that you can find shows like America’s Funniest Home Videos, Will & Grace, and Quantico, as well as shows from the Cooking Channel, the Food Channel, and more. This TV on-demand addon provides access to content through legal streams. In some cases, it’s probably best that you connect to a US server through a VPN so that you can take full advantage of the shows available through the addon. You can find USTVcatcup in the TVADDONS.CO addon repository. BBC iPlayer offers both live and on-demand TV and radio content from the BBC. You can enjoy this service through the iPlayer WWW kodi addon. This is a great option for catching up with shows such as EastEnders or simply for tuning into live BBC TV or radio. 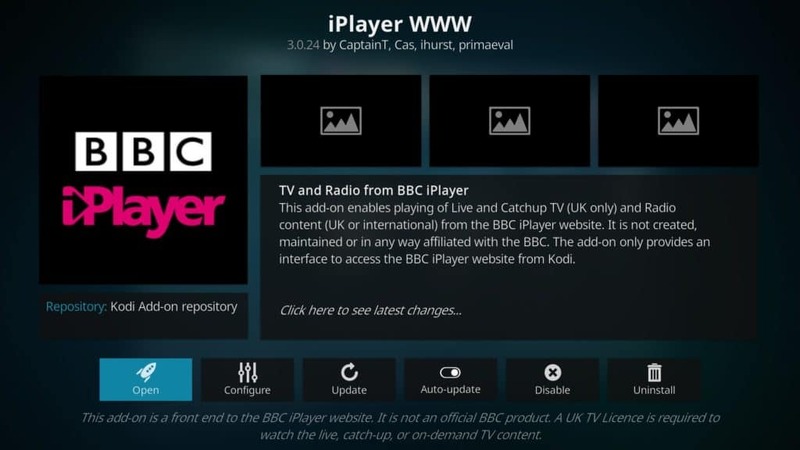 In order to enjoy content from the BBC iPlayer through iPlayer WWW, you will need a valid UK TV license and a suitable VPN since iPlayer is geolocked to the U.K.
You can find iPlayer WWW in the official Kodi addon repository. Another option to legally access live TV content is through the TVCatchup Kodi addon which provides access to the service from TVCatchup. With TVCatchup you will be able to watch 32 different free TV stations legally. There are British channels such as those available through ITV and a few BBC offerings, QVC, and Al Jazeera. 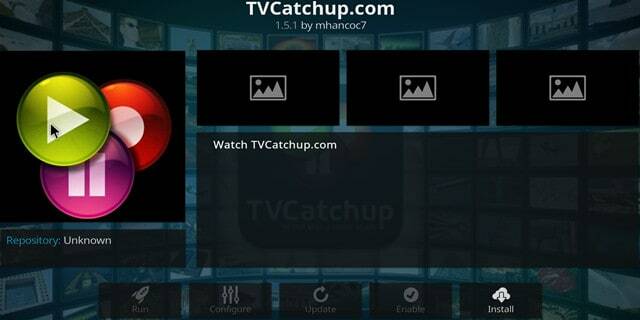 You can find the TVCatchup addon in the TVADDONS.CO addon repository. Pluto.tv is a free streaming television service which offers a large library of channels as well as on demand movies and TV shows. 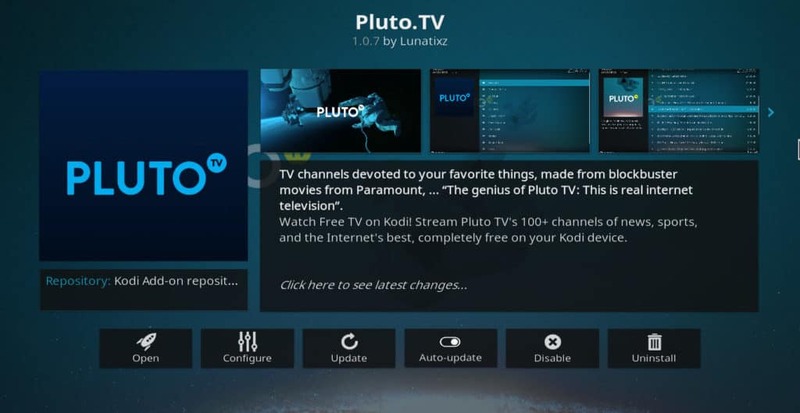 You can enjoy Pluto.tv through its official Kodi addon. You will have access to unique channels that you will only find on Pluto.tv like IGN and Anime All Day and more traditional channels such as Bloomberg and NBC News. On demand videos from sources such as CNET and Geek and Sundry are also available. The Pluto Browser is available in the official Kodi addon repository. 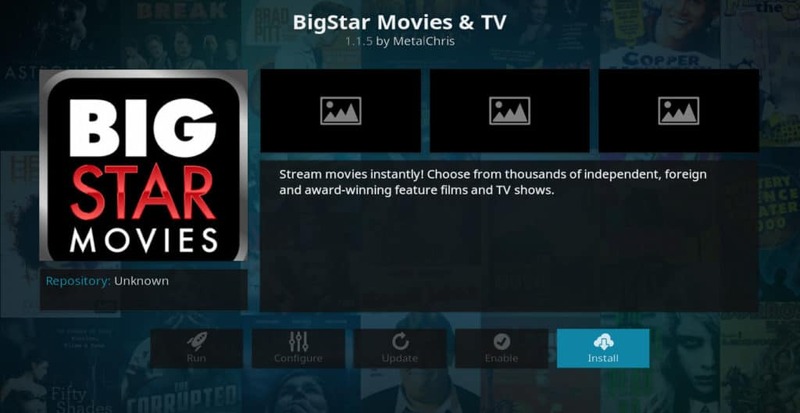 Big Star Movies is another streaming platform option available. It has a kodi addon available through the MetalChris repository. It doesn’t seem like there are many mainstream titles available through Big Star but Mind City Terror and In The Cage are two of the many exciting movies available. You can also find a wide variety of documentaries covering topics from cars to music. You can find TV episodes of shows like the Inbetweeners and Shinobi Girl as well. There are no live TV options but there’s plenty to keep you occupied. USTVNow is a live TV service which broadcasts the major US TV networks. Its functionality is made available through the USTVNow Plus addon available from the official Kodi repository. Signing up for the free package lets you watch ABC, CBS, CW, FOX, NBC, PBS and My 9. Upgrading to a paid package gives access to more channels as well as DVR capabilities. USTVNow is a great option if you are just interested in getting live TV. PopcornFlix is mainly geared towards movies and can be found in the official Kodi addon repository. Accessing the movies is free and they are available across several categories. You will find Sci-Fi, Family and Mystery movies to name a few and some TV shows. Although content is provided for free, you’ll find mainstream titles such as The Last Airbender and Badges of Fury on PopcornFlix. It should be noted that PopcornFlix is currently only available in the US and Canada, but you can bypass this geo-restriction by connecting to a server in one of the two countries with a VPN. Documentaries are quite the educational resource. If you’re just looking for a documentary fix then you should get Top Documentary Films from the official Kodi addon repository. You can find documentaries such as HBO’s State of Surveillance with Edward Snowden from 2016 through the addon as well as Immortal from 2018. Top Documentary Films is available in the official Kodi addon repository. Which Maverick TV alternative will you choose? FilmOn Simple covers all of the bases that Maverick TV does in that it offers live TV, documentaries, movies, sports and documentaries. However, it should be noted that you might not find all of the same types of content through this one addon. While the other alternatives mentioned do not cover all of these content categories, you might need to supplement FilmOn Simple with one or several of them in order to increase the amount of content available to you.